Andy Freeberg posted a video about a fictional character whose job it is to digitally removes cats from space photos. Brant Widgen is so good at his job that you are not aware of the widespread problem that is cats "photo-bombing" stunning images of space. Ok, so not really. 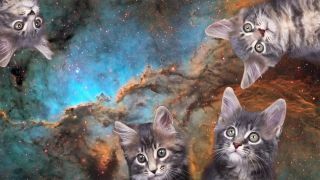 But in the spirit of April Fools' Day, SPACE.com would like to share a hilarious video about a fictional character named Brant Widgen who works as an "image enhancement engineer" whose primary job is to remove adorable but pesky cats from the foreground of space photos. The video begins with Widgen describing his typical workday. In fact, you could say that when these cats are trying to steal attention away from the wonder of these cosmic landscapes, it's Widgen's job to be firm in saying: no can haz. "The problem is that they are obscuring the astronomical phenomena that our scientists and the public would be more interested in seeing," he explains in the video. "The friends that made it were joking about all of the YouTube comments where people claim NASA is photoshopping their content to fake things," Freeberg said in an email. "In particular, they were talking about a video of sunspots that commenters claimed were fake. They thought it was funny that people would believe NASA would be going to the trouble of photoshopping sunspots into scientific images and that started the joke that they also have to photoshop cats out of the pictures to make them look 'right.' That idea, combined with the fact that a lot of the Astronomy/Hubble images really do get photoshopped to make them more appealing, was the seed of the idea." The character of Widgen is fictional, and Freeberg said his friend, Ryan, improvised most of the lines. "I also just love the idea that there's this guy out there whose entire job is sitting in a cubicle and photoshopping cats out of astronomical images and yet who talks about it in a completely matter-of-fact way," Freeberg said. In the video, Widgen talks about his job and shows examples of before-and-after images featuring his handiwork. "I think there was a time in my career where I did resent space cats and their tendency to photo-bomb these images, but it's like getting angry at the sunshine," Widgen said. "It's like being jealous of a bag of sand. These things are just things and they're doing what they're meant to do." In some images, Widgen shows where the cats originally were, saying that he can still see "the feline signature." He also goes on to say that his most difficult case of "space cat photo-bombing" was the famous Pillars of Creation image from the Hubble Space Telescope. "There was a tiny, little tabby peeking around one of the pillars, and it was just too adorable to erase because it was like the pillar was his little scratching post, and he was peeking out to say: hello, I trust you. I love you," Widgen explains. For Freeberg and his friends, the video is also something of a commentary. "One of the best parts about the video is that it plays on the idea of what is "real" and the skepticism people have surrounding anything involving space," Freeberg said. "Forget the moon landing conspiracy, we've just blown the roof off of the space cat conspiracy and the world will never be the same." Yet, at its core, the video is meant to be funny and lighthearted. "[T]he video was basically made as a joke, but we're glad people are digging it," he said.